Adding a water garden to your outdoor living space allows you to create a tranquil atmosphere where you can enjoy the sights and sounds that only nature can provide. 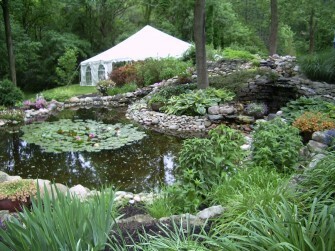 Whether you are building a new pond, expanding or waterscaping an existing water garden, or looking for garden décor and accessories to highlight the beauty of your outdoor space, we have what you need at Freshwater Farms of Ohio. Our retail store is stocked with pumps, pond filters, pond skimmers, pond pumps, pond liner, flexible PVC pipe and tubing, halogen and LED underwater lights, UV clarifiers, bottom drains, pre-filters, pondless waterfall equipment, DIY water garden kits, water treatments, water plants, Koi, goldfish, fish foods, and more. Before installing a water garden, consider the overall location of your pond in relation to your house, deck, flower gardens or recreation areas where kids will be playing. You will need to install your pond within reach of an electrical supply for a pump and other accessories you may wish to add (such as lighting kits) and a garden hose. Installing directly under trees can make for some difficult digging. If you do choose to plant under trees, which is a natural setting for a pond, consider purchasing a light weight net to catch the leaves as they fall in the autumn. Make sure your spot is level and gets about a half-day of sun. You are building a pond to enjoy it, make sure that you choose a location where you can easily see the best features of your pond. Next to a patio or deck, near an entranceway, out the kitchen window, or near other places where you spend a lot of time, will increase your enjoyment. Before you dig, check local regulations and zoning restrictions. If you belong to a neighborhood homeowners’ association, find out if you need approval to add a pond to your property. Some insurance companies require notification when you install a water feature and ask you to secure it with a fence to protect children and animals. Call your utility companies before you reach for the shovel. They’ll mark your lines so you don’t cut into anything.